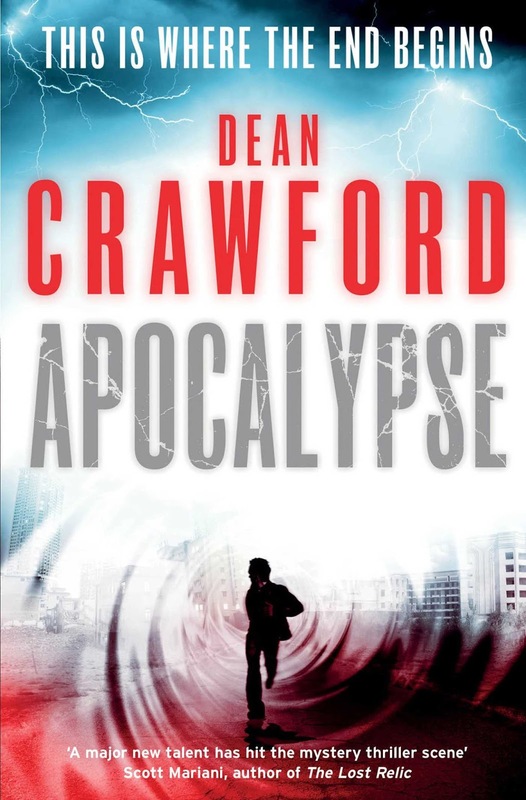 Apocalypse by Dean Crawford is the third in his Ethan Warner series, published by Simon and Schuster. Ethan Warner is simply going about his job like any other day, hunting down criminals and cashing them in for the bounty on their heads but on June the 27th everything changes. Both Ethan and his colleague Nicola Lopez are drafted into a DIA investigation that at first seems an open and shut case. A man named Purcell had been seen fleeing his home, where the brutally murdered bodies of his wife and daughter were later found. At first, everyone jumps to the logical conclusion that Purcell is the main suspect. One phone call later and the lead investigator on the case thinks quite differently. During that phone call, Purcell accurately predicts the future moments before it unfurls. The phone call is traced to miles away from the crime scene, there is no way he could have been watching and Purcell explains that he will also be murdered within 24 hours and needs help. When the officers track down the hotel room the call came from, Purcell is gone. So how did Ethan get involved? Well, on the mirror in that room, a message was scrawled on the mirror. Apocalypse is the first novel in the Ethan Warner series that I have read and was happy to find that they contain completely separate stories and can be enjoyed individually (although I am sure you gain more insight into the main characters by reading them all). Two chapters in and this book had me hooked. With ballsy characters, all-out action, a flourish of violence, a tiny dab of science fiction, dusted off with a sprinkle of physics and you have a great thriller. One of the reasons it really captured my imagination was the scientific detail that Dean Crawford has gone into to justify the time/space elements of his story. I won’t lie, some of those bits I had to read twice to get my head around them but if anything, that made me appreciate it even more. I am sure many people will jump to classifying this as a ‘man book’ but it would be sad to do so. Yes, it will probably appeal to men more than the latest Jojo Moyes or basically anything with pink on the cover but I would highly recommend this to anyone. If you managed to genetically engineer a cross between 24’s Jack Bauer and a Michael Crichton novel, then you’d get Ethan Warner. All out great fun. You have written a number of novels but was there something that happened, or something you read that made the plot for Apocalypse come to mind? I wanted to do a story about time that was different from all the others. There have been so many that have involved “machines” that mysteriously transport people back and forth through time etc. I wanted to write a story where the machine could plausibly be built using today’s technology. I’m a great believer in making the impossible possible, and try to do so in ways that reader will find believable. The ability to see forwards and backwards through time is surprisingly common – you’re doing it as you read this. It takes the light a tiny fraction of a second to be emitted from the screen and reach your eye. That tiny fraction of a second means that you’re seeing the screen as it was a moment ago, in the past. Do you have a favourite character in the book? And if so, was it also your favourite character to write for? For Apocalypse, I enjoyed writing Scott Bryson. He’s a rogue, a drunkard of questionable morals – what’s not to like? Morally ambiguous characters are always more fun to create, while the hero and heroine of the novel must, of course, come good in the end and I try to create dilemmas for them too, to humanise them as much as possible. I don’t like the books where the protagonist is a square-jawed Superman: I think readers identify with someone that seems human and flawed just like us all. Are any of the characters inspired by real people in your life? Only one, Doug Jarvis is a recurring character in all of the Ethan Warner series, and is named after my late grandfather, Douglas Ian Jarvis. He served with the RAF in World War Two and was deployed with Tiger Force to Okinawa in 1945. He was a wonderful guy and is much missed by all of our family. Do you have any strict rules you set for yourself when writing? Daily word counts, plot layout or time limits? I’m a methodical plotter, planner and writer. I usually spend about three months researching, plotting and planning a novel, and then the remaining three months writing and editing it. When writing the first draft I aim for about 3,000 words per day and as I write Full-time I do this from Monday to Friday, 9-4. Writing requires discipline, and a career like mine doesn’t come easily, so I tend to commit fully to each novel. I usually take a week off after every first draft, to have a break from the screen. This year that week will be over the Christmas Holiday. How would you describe Apocalypse in one sentence? A novel where the past is the future and the future is now uncertain. After this novel is released I think you’re going to have a lot of people wanting to know, do you have more planned? Apocalypse id the third to be published in the Ethan Warner series, but book four has already been written and I’m working on book five right now, with both due for publication in 2013. I also have two more synopses waiting for Simon & Schuster, should they decide to continue with the series. Robopocalypse by Daniel H. Wilson, a great mix of science fiction and science fact.